The twilight language explores hidden meanings and synchromystic connections via onomatology (study of names) and toponymy (study of place names). This blog further investigates "name games" and "number coincidences" found in news and history. Examinations are also found in my book The Copycat Effect (NY: Simon and Schuster, 2004). UPDATE: Investigators found three marijuana "grow operations" at residences where eight family members were slain in southern Ohio, state Attorney General Mike DeWine said Sunday at a news conference. He didn't say whether the marijuana was connected to the execution-style killings discovered last Friday at four residences in Piketon. According to DeWine, 18 pieces of evidence has been submitted to the crime lab and at least five search warrants have been issued and completed. Source. The name game has hit another Pike location, rather dramatically, and involved a Wayne, elsewhere. Most Pike counties around the country are named after Zebulon Montgomery Pike Jr. (January 5, 1778 – April 27, 1813), an American soldier, explorer, and Freemason, whose Pike expedition, often compared to the Lewis and Clark Expedition, mapped much of the southern portion of the Louisiana Purchase. Pike's Peak is one of the most famous locations named after Zebulon Pike. I'm not talking here of such spooky tongue-twisters as H.P. Lovecraft's Yog-Sothoth or Arthur Machen's Ishakshar, but of quite ordinary names like Bell, Beall and variants, Crowley, Francis, Grafton, Grubb, Magee/McGee, Mason, McKinney, Montpelier, Parsons, Pike, Shelby, Vernon, Watson/Watt, Williams/Williamson. Ohio Attorney General Mike DeWine said eight people were found dead in Pike County, Ohio, on Friday, April 22, 2016. Originally said to be seven dead, the toll is up to eight. 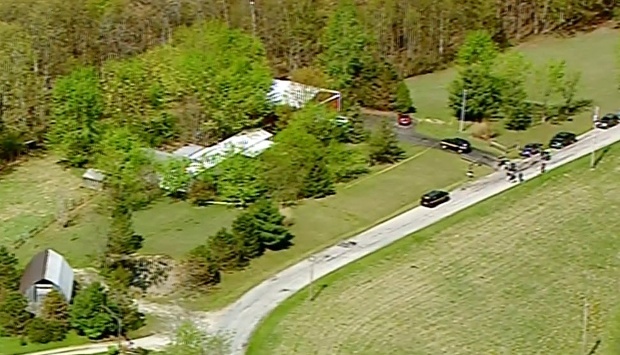 The eight people were found shot to death at a Pike County home. Reports indicate as the people are dead in Pike County, near the Adams County line, east of Peebles. At least eight members of the Rhoden family, including a 16-year-old boy, were found dead from gunshot wounds to the head at multiple locations along Union Hill and Left Fork roads just northeast of Peebles early Friday morning. 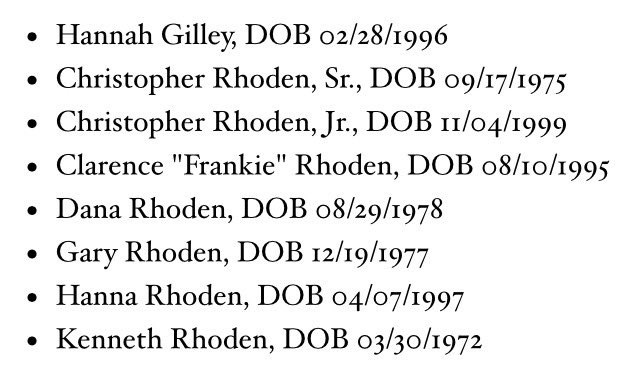 The name Rhoden is generally associated with the German name Roden. Roden is a name of Germanic origin, originally meaning "red valley." Officials said the victims were shot "execution-style." All of the victims are believed to possibly be members of the same family, and they were found in four homes. 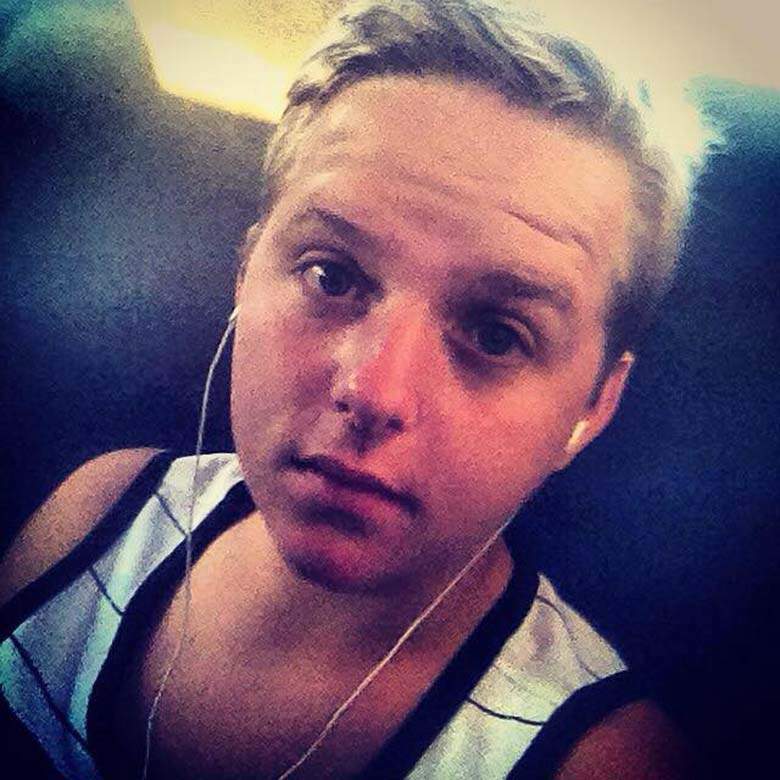 DeWine also told WLW radio that "the assailant is probably loose somewhere." Three juveniles were also recovered alive from the crime scenes, a 4-day-old, a 6-month-old and a 3-year-old. 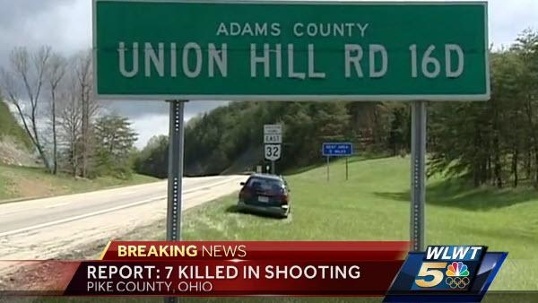 None of those found shot appear to be suicides, indicating that it is likely that the assailant is at large, DeWine said. DeWine said they do not know the motive at this time. 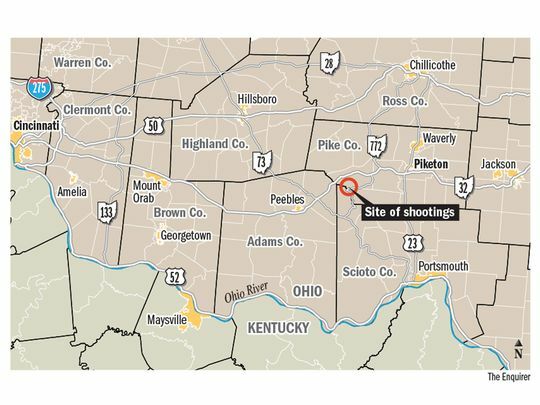 A spokesperson for Ohio's Bureau of Criminal Investigation said earlier that "we are sending everybody" to the shooting scene near the Adams/Pike county line. 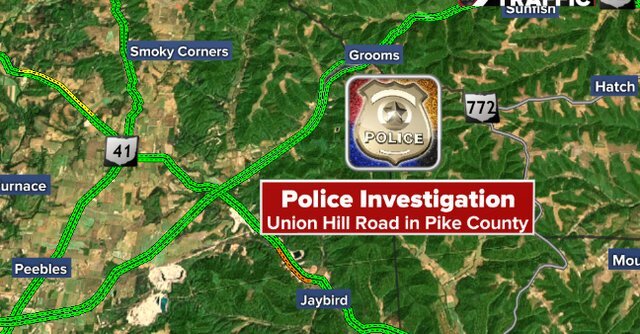 Spokesman Dan Tierney said the Pike County sheriff's office requested state help at 8:20 a.m.
Union Hill Road runs off Ohio 32 at the county line. Aerial video shows officers standing outside a home with crime scene tape around it. More than two dozen vehicles were parked along the road in front of the home. 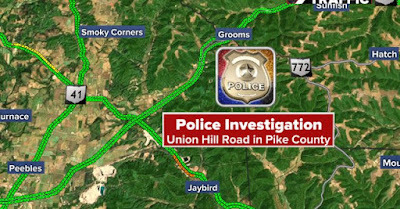 Three ambulances and more cruisers were parked near where Union Hill Road meets Ohio 32. 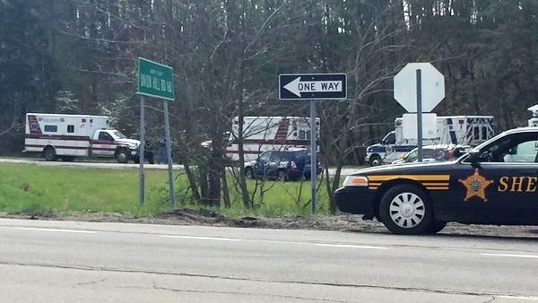 The FBI in Cincinnati also said it was closely monitoring the situation and has offered assistance to the Pike County sheriff's office if needed. Pike County victim's advocate Dave Dickerson said about 20 members of the family had gathered at the church to await information. He said they had been given little information so far. Dickerson said he had been told as many as two children were taken to hospitals, but he didn't know anything about their identity or condition. In Adams County, a few miles west of the crime scene, Peebles High School was on lockout for some time, but it was lifted shortly before 11 a.m. Early reports told of seven, not eight, being killed. The house sits in Pike County, near the Pike/Adams county line. "I was told we are out of danger. We feel sure of that," Superintendent Richard Seas said. "Reports we are receiving from Peebles are tragic beyond comprehension," Gov. John Kasich wrote on his Twitter account. On his Facebook page, Chris Rhoden says he's a native of Piketon, Ohio, and attended Piketon High School. 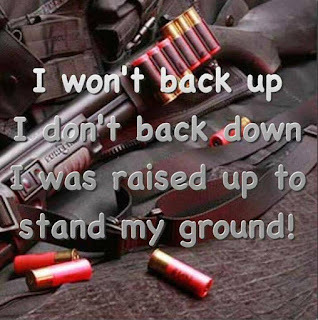 A month before his death, Chris Rhoden posted a meme of a shotgun with the words, "I won't back up. I don't back down. 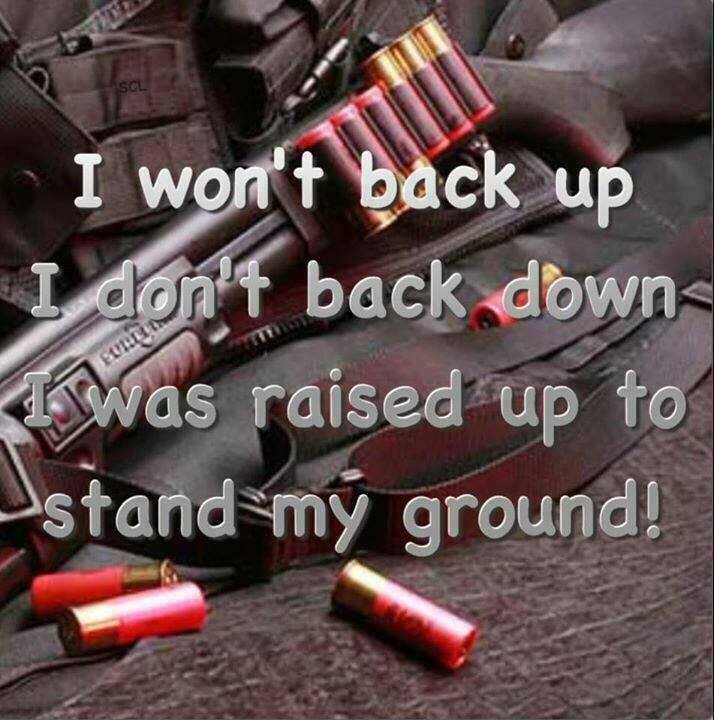 I was raised up to stand my ground," according to sources. Meanwhile, a man suspected of killing five people in a pair of shootings, April 22, 2016, Friday night later died of a self-inflicted gunshot wound, police said. Wayne Anthony Hawes, 50, of Appling, shot himself in the head, according to a statement from Columbia County (Georgia) Capt. Andy Shedd. Authorities believe he unsuccessfully tried to set his house on fire before killing himself. 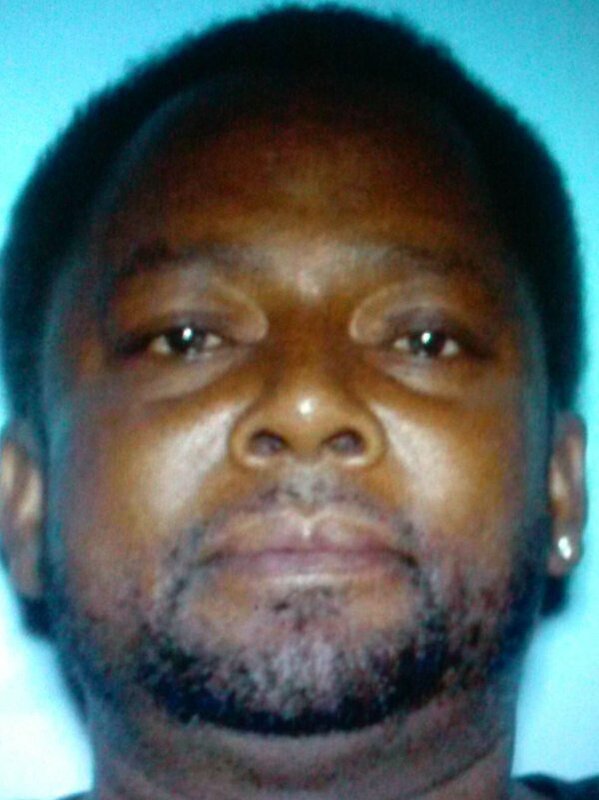 The Columbia County Sheriff's Office searched for Hawes, who allegedly shot five people Friday night. Shedd said the incident stemmed from a domestic dispute and some of the victims are believed to be related to Hawes' wife. Police first responded to reports of a shooting at 7:54 p.m. Friday at a Johnson Drive house in Appling, Shedd said. Officers found three shooting victims at that crime scene: Roosevelt Burns, 75; Rheba Mae Dent, 85; and Kelia Clark, 31. Late Friday night, Columbia County deputies say Wayne Anthony Hawes is the suspect in the Pike County deaths, allegedly, 5'9" & 230 lbs. Within the "weird news" field, it has been a well-known truism that if a criminal has a middle name of "Wayne," no one in the newsroom is surprised he is being charged with murder. The examples are multiple. The most famous case, of course, is John Wayne Gacy. See more on the "Wayne Name Game," here and here. Hawes is from a Norman female personal name, Haueis, from Germanic Haduwidis, composed of the elements had "strife," "contention" + wide "wide." An alternative origin is the place's name is derived from the Old Norse word hals, meaning "neck" or "pass between mountains." h/t Theo Paijmans & Media Monarchy. rhodo <ancient Greek meaning rose. Sub-rosa? Rosey Cross? “On April 15, last Friday, . . . we got an anonymous call from a female indicating that Allen Cooper was in Fayetteville, North Carolina,” said Sgt. Richard Erickson, squad commander of the 88th Precinct. Local authorities apprehended Cooper at his lady friend’s apartment — and he was extradited to New York on Friday to face three charges of murder. What Will Happen On April 4th? Investigator of human and animal mysteries since 1960. Swamp Thing character "Coleman Wadsworth" in #4:7 and more in #4:8, is a tribute. Author of over 35 books, including The Unidentified (1975), Mysterious America (1983/2007), Suicide Clusters (1987), Cryptozoology A to Z (1999), Bigfoot! (2003), The Copycat Effect (2004), and field guides. Educated in anthropology-zoology at SIU-Carbondale, and psychiatric social work at Simmons College School of Social Work. Began doctoral work in anthropology (Brandeis University) and family violence (UNH). Taught at NE universities (1980 to 2003), while concurrently a senior researcher at the Muskie School (1983 to 1996), before retiring to write, lecture, consult, & open museum. Popular documentary course was taught for 23 semesters; appeared on C2C, The Larry King Show, MonsterQuest, Lost Tapes, In Search Of, and other tv programs. Loren Coleman is a dedicated father (Caleb, Malcolm, Des), cryptozoologist, media consultant, and baseball fan. ©Loren Coleman 2003-2013. Awesome Inc. theme. Powered by Blogger.